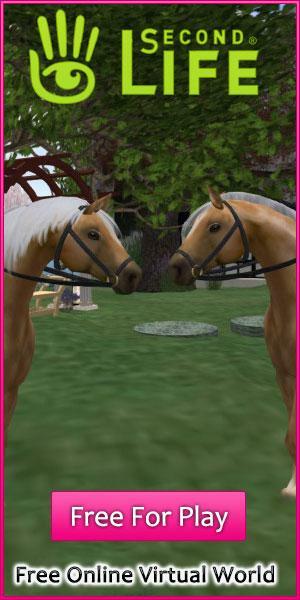 Rate this Article Are you a Second Life resident who wants to play horse sims? Well, you need not look any further because you can do exactly that in the virtual world that you’ve come to love. Are you a Second Life resident who wants to play horse sims? Well, you need not look any further because you can do exactly that in the virtual world that you’ve come to love. All of this is possible at the Aero Pines Park and Recreation Area, which comprises of 8 whole regions of virtual real estate developed specifically for avatars who’d like to become equestrians or horse riders. There are lots of activities here that you will certainly enjoy, and lots of people who share the same interest as yours with whom you can interact. What can you do here? For starters, you can join a beta program that aims to foster authentic interactions between horses and the avatars who ride them. In here, you get tips not just on how to ride horses in the virtual world but also in real life! You can consider it as a virtual riding school, in which you can immerse yourself in education about horseback riding before you try the sport out in real life. The program also includes classes in equine psychology. In other words, you also learn to deepen your relationship with your horse by learning how it possibly thinks. This is quite an endeavor, especially for a virtual world, but the people behind Aero Pines Park and Recreation Area are pioneers in what they do. The program is called the “Horse Avatar and Human Avatar Interaction,” and is headed by avatar Cindy Bolero. Contact her inside the game world if you want to sign up as a volunteer. More experienced horse riders can also enjoy doing rodeo in the grounds. Of course, horseback riding will never be complete with trails, and Aero Pines Park offers quite a lot of that for novices and experts alike. The Recreation Area is currently being developed by The Bolero Group, and is the latest home of the Riding Club Academy and Rodeo Grounds. The Club was formerly based on the Azure Islands, where they were able to develop trail rides that pass through picturesque virtual beaches on their way to the prime destination: a huge virtual volcano whose peak avatars can climb up with their horses and from which they can enjoy a wide panoramic view of the regions. Unfortunately, the original Volcano Ride closed down in 2008, around which the Club was able to acquire 14 new regions that was developed jointly with Balsa Airport. Unfortunately, the region, called Avia, became a point of conflict between Balsa and the Bolero Group after Balsa began harassing avatars who rode the trails. After the partnership dissolved, Lone Star Ranch Riding Horses stepped in in 2009 and helped the Bolero Group acquired 8 new regions that ultimately became Aero Pines Park and Recreation Area. It’s easy to find Aero Pines Park and Recreation Area on the map. In no time, you’ll be fulfilling your horseback riding dreams in Second Life!